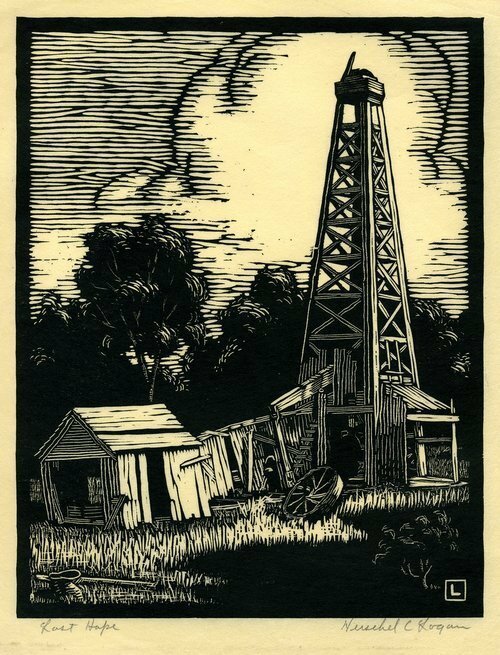 A black ink on rice paper woodcut showing a deserted oil derrick and a collapsing shed. Lost Hope was drawn by Herschel C. Logan, who was born April 19, 1901 in Magnolia, Missouri , and shortly after his birth the family moved to Winfield, Kansas. He attended the Chicago Academy of Fine Arts for one year. Logan was a commercial and advertising artist in Salina, Kansas, until his retirement in 1968. He was a member of the Prairie Print Makers. After retirement, Logan moved to Santa Ana, California.